My husband is a restaurant recruiter. That means we get to visit restaurants where he'd like to find people jobs or ones where he's gotten someone a job. I know, rough, right? Not too bad, but we really need to cut back on all the eating out we do. That being said, this past Saturday we visited Miss Shirley's Cafe. I had never been to the cafe before, but Fred had gone to a different location. We headed down to Annapolis for brunch. Now, for the record, I eat breakfast every single morning. It's the only routine that I know of in my life. I wake up, I eat. This morning, I didn't eat. We ran to the bank, then drove down to Annapolis. There's parking behind the restaurant, and they validate the parking! Score!! We walked around to the front of the building, and proceeded into the restaurant. I almost circled back through the revolving door when we saw how many people were waiting. I wish I would've taken a photo of the crowd. We were squished near the revolving door, after finding out it was a 40 minute wait. FORTY MINUTES people...for the gal who hasn't had breakfast, and it's a little after 11am! People who came in after us, would actually get hit by the revolving door because at some points, there just wasn't any where to go. The waiting area, was big and spacious. I just think half of Annapolis chose that morning to eat at Miss Shirley's Cafe! Fred offered to go back on a different day, but I wasn't feeling well, and going somewhere else just meant having to wait there as well. So we waited, the 40 minutes. There were a handful of kids there, but none of them were screaming or being obnoxious because the servers give them Etch-a-Sketches to play with! We had a nice spot for two, and our waitress was enthusiastic, in a good way mind you. She was bright and bubbly. She gave us a rundown of what was on the specials. I should've taken notes because what was offered were mostly things I'd never heard of before. They do a lot of specialty food at the Cafe. 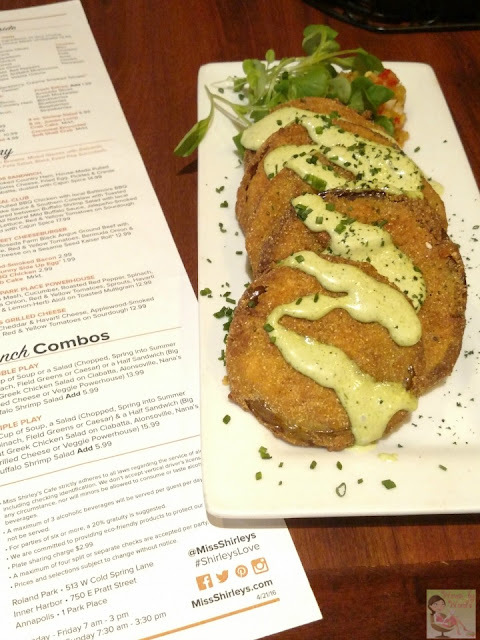 We started off with an appetizer of Fried Green Tomatoes. I'd never had them before, and actually wasn't a fan. I really liked the batter on the tomatoes. I just think the green tomatoes had...well, a green tomato taste. lol Go figure. I'm a traditional red tomato kind of gal I guess. =) Fred on the other hand enjoyed them. I think if you're a fried tomato kind of person, then you'd really enjoy these. I never loved omelets until I tried my dad's one day in my late teens. I don't ever make them, and should, but since we were out for brunch, I was going for it. I ordered the "An Omelet To Call My Own" I ordered 3 ingredients that are part of the basic price: asparagus, tomato, and ham. I paid the extra .99¢ for cheese. 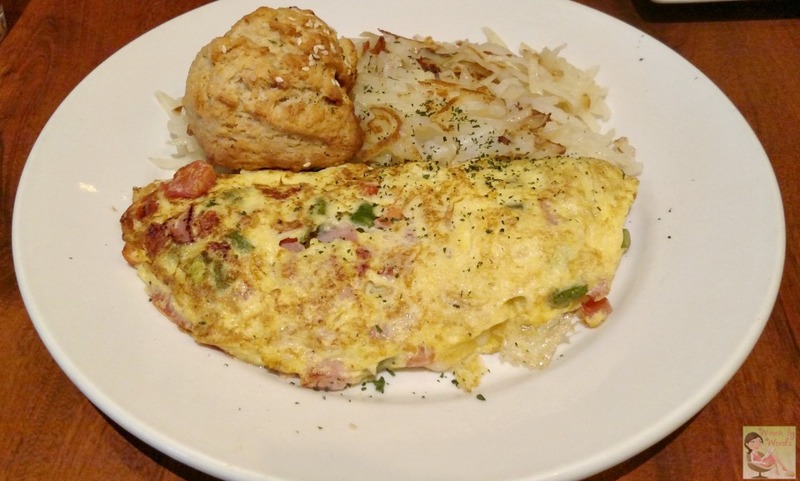 The side I chose to come with my omelet was potato & onion hash browns. Fred ordered the "Grandpa's BBQ On A That's How We Roll." 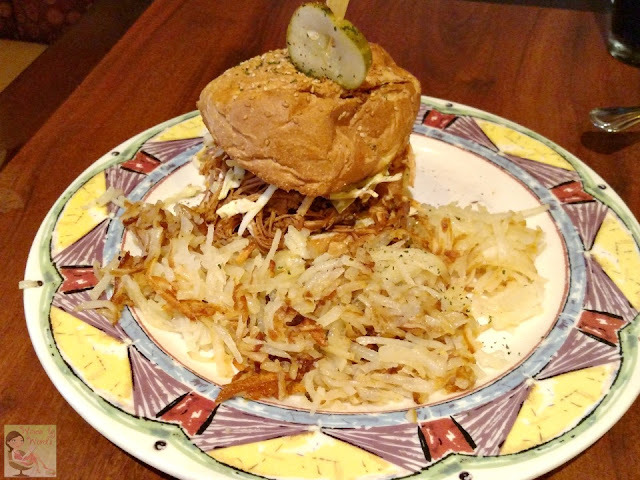 It's pulled barbecue chicken topped with coleslaw & fried pickles. He had the same side dish as me. Copycat! My omelet turned out delicious! Very good flavor, the cheese was melted inside like I love it! Asparagus is one of those things that I think can be tricky to add to a recipe. I'm thinking that people like theirs cooked differently. I like mine somewhat soft. This was kind of hard and crunchy. For me, it tastes more bitter when they're still hard. Plus, it's hard to compare other asparagus to my husband's because he does it best in my book. Oh, and I had an interesting biscuit. Like I said, they make It was a normal biscuit, but it was a peach and goat cheese biscuit. I guess they're always trying new recipes, and make everything from scratch. I was curious as to what it was because when I went to eat it, there was this chunk of peach that fell off the bottom, and I thought it wasn't supposed to be there. Our waitress had to double check what the biscuit was that day. =) It was pretty delicious to say the least. Fred's food looked good. It was a pretty tall sandwich. At one point he took the top bun off and was going to eat the sandwich open face. He finally just put that too the side, and ate the meat. All in all, the food was good, and the atmosphere was really nice. Next time we go, I know to eat something a couple hours earlier in case there's a long wait, and we won't go on a Saturday morning. lol By the time we were leaving, there really wasn't anyone in the waiting area. I think the next time we go back, I want to try their dinner menu. I like trying new foods at restaurants where they're always coming up with something new! What is your favorite brunch food?